Standing shoulder to shoulder, the OCHS class of 2018 gathers together one last time. Photo by Tony Heward. In one of the never ending cycles of life, graduation season wound down in Osage County with the commencement ceremony for the Osage City High School class of 2018 on Sunday, May 20. This year’s class of 34 graduates recognized two of their fellow classmates as honor students, Weston Littrell and Georgia Hutton, who encouraged them to overcome obstacles and live their dreams. Hutton told the class that she wasn’t going to dwell on their memories in her speech, or the future. “There’s been good times, bad times, and even really super weird times, but I’m not going to do that today,” Hutton said. She noted she had spent much time worrying about her future. She urged her classmates to not forget their roots, but to live for their dreams. Hutton ended her speech by sharing one of her dreams, reciting a verse she had written specially for graduation. Littrell pointed out, “It’s been a long road to get to this point, and yet the drive sure went by fast. “Now, here we are, at the end of our school careers, about to begin the next journey of our lives and enter into the real world – Lord help us all,” he said. He noted the class had already faced a lot of adversity. “It’s no secret that our class loves sports, and there are many lessons on adversity that can be taught from them,” he said, comparing different sports to life’s struggles. “Sometimes, life is like the game of football. It’s rough, yet fun, and you learn to tough it out by playing it. “Life is like running a race. It’s not always a sprint or a long-distance race, but a lot of times it’s a mix of both. You have to know when to sprint and when to slow down to save your energy … just get to that point and then I’m done suffering. “Life is like baseball. It’s all about being patient and knowing what to do at all times. You always have to have a plan for every situation, and you need to be ready for action at any moment. He challenged his classmates to work through adversity to find their success. Osage City High School Principal Tony Heward presented the class for graduation, and USD 420 Board of Education members Jay Bailey and Todd Peterson presented diplomas. 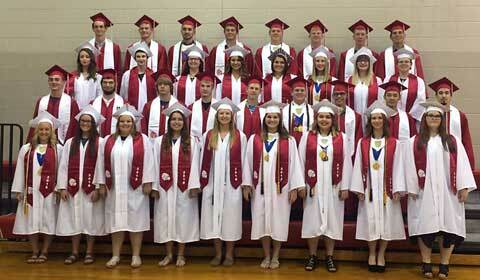 Graduating as the OCHS class of 2018 were Whitney Dawn Camell, Jarrett Alan Combes, Ean Kyle Couch, Justin Scott Davis Jr., Timberly Kay Dunham, Cherokee Alexis Rose Everhart, Cole Eddward Fillmore, Cameron Allen Grass, McKenna Rose, Kacey Lee Hill, Faith Nicole Holmberg, Jordan Kay Hon, Jonathon Tomarcus Hutcheson, Georgia Shae Hutton, Cassandra Hope Jenkins, Brianna Elise Jones, Tucker John Kimball, Aiden Hongxuan Liang, Weston Cole Littrell, Faith Elizabeth Long, Robert Arlen McDaniel, Brayden Lee McDowell, Jordan Christine Middleton, Courtney Mae Mitchell, Rider Tristen Todd Nettleton, Peyton James Pearson, Molly Michelle Plinsky, Zoe Alexis Schmitendorf, Dalton Reid Shaffer, Jasmine Michelle Stevens, Brayton Scott Stromgren, Carter Alan Swindale, Emma-Lee Elane Taylor, Tyson Dean Wilkins. USD 420 Board of Education members include Jay Bailey, Todd Peterson, PJ Heptinstall, Mike Pitts, Corey Linton, David Williams, and Sarah Peterson. USD 420 superintendent is Troy Hutton.